"Winchmore Hill gastro-pub serves up tasty grub"
Winchmore Hill is a little off the beaten track for young urban dwellers, though many will have heard of the (in)famous Priory Clinic which is situated in Grovelands Park. 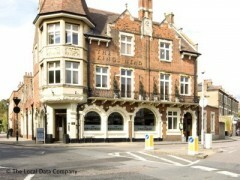 Rehab stories aside, we’re traipsing up Station Road to get to The King’s Head pub in unusually sweltering heat. We peer into the windows of jewellery boutiques and furniture shops, which are mostly eerily quiet. There are few people around, with the exception of the odd mature couple. Inside the King’s Head itself, books and mock-antique relics sit on shelves, tables are wooden and worn, and chandeliers and low-hung lampshades characteristic of Geronimo Inn pubs hang from a very high ceiling. The large beer garden has a mysteriously illicit-looking covered area that is mostly dark and filled with black bed-like seating. Groups of men sip pints and enjoy the heat. Back in the dining area we sit on cushioned seating and are slightly confused by the toilets. Two doors masquerade as cabinets lined with bookshelves. I push the door marked ‘queens’ but when it offers resistance I worry it might actually be a book cabinet and I’m making a fool out of myself. Luckily it’s just being stubborn. On the menu I notice the butterbean hummus. It turns out to be a pot of mashed butterbeans, lemony with a hint of garlic, accompanied by crusty bread and salted butter. It’s not strictly hummus as it doesn’t appear to have tahini, it’s tasty however. The other starter consists of plump mussels in their shells, which taste of garlic and white wine thanks to a buttery sauce. The mains on the menu are hearty and traditional compared to some of the other Geronimo pubs I’ve visited - roasted pigeon and foie gras are replaced here by rib-eye steak, beer battered cod, and roast corn-fed chicken. The steak is chargrilled and just about crisp on the outside, a mound of mushrooms in garlic butter comes with it. The pan-fried pork fillet is very tender and flavoursome, apple sauce and a mustardy mash potato made with wholegrain mustard complete the wholesome dish. To end the meal I have a climactic, creamy, velvety chocolate mousse. Served in a brandy glass, it’s so good that each spoonful is a deliciously sensual experience. Well fed and satisfied, as we exit past the bar we realise that is where all the twenty and thirty-somethings have been all evening: not eating. Oh well. A three course meal for two with wine is roughly £70. Portions are generous, therefore I’d recommend an appetite.